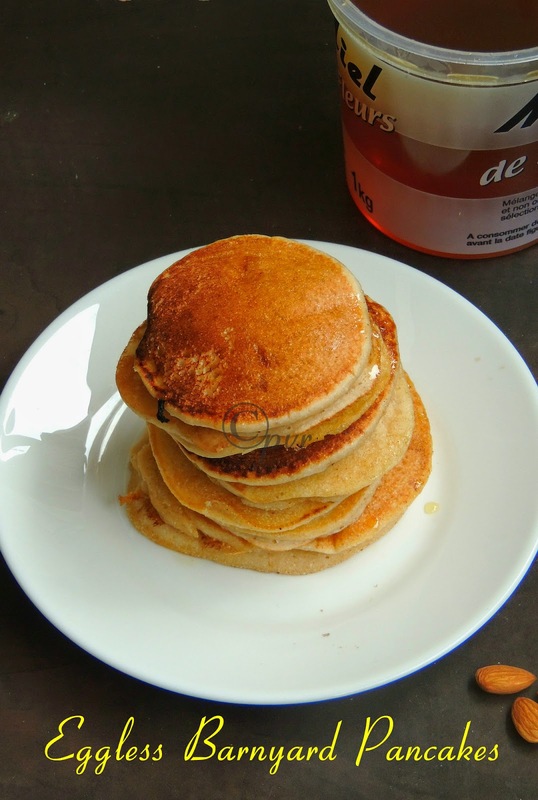 I have been experimenting with different millets since ever i came know about their health benefits, one of my recent trial with barnyard millet aka kuthiravali is this eggless fluffy pancakes. Yes you read it rite, i prepared an eggless pancakes with barnyard millet along with almond meal and wheat flour for our breakfast. My lil one loves pancakes to the core, he can have pancakes anytime of the day. I prepared barnyard millet flour myself at home to make this pancakes, barnyard millet flour mixed with whole wheat flour and almond meal makes this incredible, fluffy and super filling protein rich pancakes.Its not hard to make barnyard millet flour at home, just dry roast the millet and grind it as fine powder, sieve it and conserve it in an air tightened box. This is how i prepared this barnyard millet flour. You can follow the same way to make varieties of millet flours. Today's post is my last post for this week's blogging marathon, you might have noticed that i have been posting different millet based dishes for the past two days. I chosed All about millets as this week's theme, i tried couple of dishes as am trying to create with these incredible protein rich nutritious grains.If you are bored of making South Indian dishes with millets, give a try to this pancakes. Sending this post to Ahlan Ramadan-The Healthy Way.Check out the Blogging Marathon page for the other Blogging Marathoners doing BM#42. Take the millet flour, wholewheat flour, almond meal, sugar, baking powder, salt in a bowl. Add in the yogurt, vanilla extract,oil in a bowl. Add the wet ingredient to the dry ingredients,add enough water to make a thick batter. Heat a non stick pan,gently drop enough batter for pancakes,drizzle oil or butter if needed. Cook on both sides until they get well cooked.. Serve warm with honey,maple syrup,chocolate syrup or nutella spread..
Wow! this is absolutely healthy and delicious..loving it. wow, thats a very healthy batch of pancakes. Awesome. I make ponfal only. Intresting recipe. Can u tell me about almond meal. They look very soft and fluffy! Wow, protein packed pancakes. wonderful. 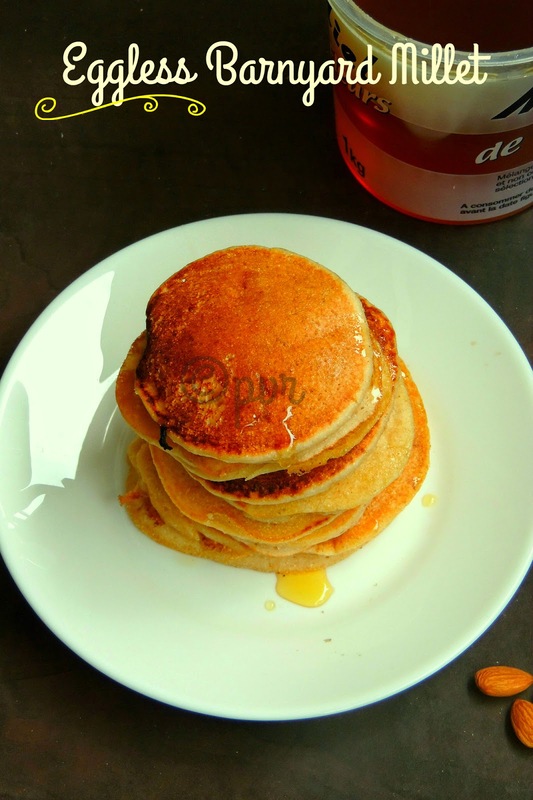 Vidhya, its finely grounded alomonds..
Wow Priya, I love these pancakes..so nicely done!..enjoyed your millet display! Is there any cuisine u cannot handle Priya? :) Perfect looking pancakes. Wow! these pancakes sound so tempting. Pancakes looks so tasty and healthy ! Lovely pancakes.. Very inviting & tempting. This is lovely priya. I ahve bookmarked these to ry for my daughter. Healthy pancake is tempting me to try. Interesting recipe.